Feeling stuck? Overwhelmed? Unsure of what path to take or learnership to apply to? That is NORMAL! Very few people know what they want to do professionally from the start and actually stick with it long-term. This is something we are looking to change. Whether you are trying to determine what you want to study in college, or you are researching learnership opportunities that blend well with your major, it is important to explore. Far too many students waste months, even years of their lives studying a subject that isn’t for them or working a dead-end job that they don’t feel passionate about. 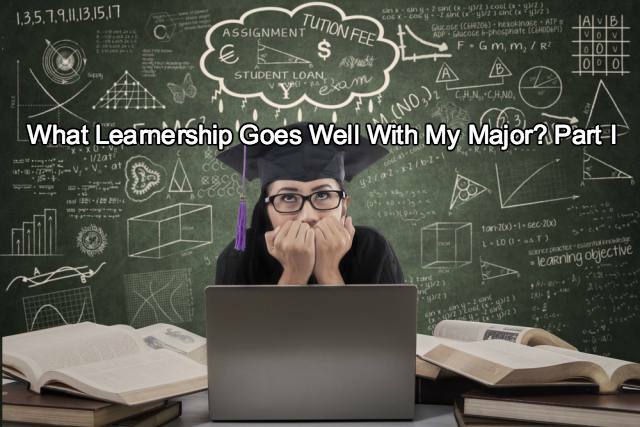 In order to make the most of your education and to help set you up for success professionally, we have compiled a list that should help you determine what types of learnerships would go well with your major. Many assume that to be in journalism and English is simply to write. While journalism and English majors often do cross paths while applying for learnerships due to their common ability to write well, there are far more options than just that. They involve gathering and distributing/communicating information over a variety of mediums. Communication and social platforms are continuously growing, as is the demand for talented wordsmiths. If you are studying Journalism and/or English, you may consider applying for a learnership at a local news station, a radio station, the newspaper or even a literary agency. Another common match-up is journalism and politics or law. Are you capable of writing and delivering a compelling argument or idea? Perhaps law school is in your future! There are many engineering specialties, the most popular being civil, chemical, electrical and mechanical. Students in engineering tend to have very analytical and complex ways of thinking, which is highly attractive to technical companies that rely on math and science. If you are an engineering major, chances are you are a problem solver. Now, what kinds of companies would benefit from your knowledge? Innovators, inventors, designers, researchers and more. While the following companies are dream jobs for most engineering students, the focus here is the TYPE of company to apply to for a learnership. Think Google, Yahoo, Boeing, Facebook, Pinterest, and NASA, to name a few heavy hitters. A degree in accounting means a wealth of learnership and career opportunities. This is because it is a basic element of any business, as it ultimately determines its performance and bottom line. The demand for individuals with accounting expertise is high and showing no signs of slowing. Taking this track can mean a corporate career, a finance career, government work, a job at an accounting firm, the entrepreneurial track, and more. As a current or prospective accounting student, you know that in order to become a Certified Public Accountant (CPA), you must study for and pass an exam. By the time you do, you will have a better idea of whether you want to work in budget analysis, company auditing, consulting, finance, etc. Accounting majors typically take the audit or the tax career route, often not knowing which direction is best for them until they participate in a learnership. Accounting firms or the accounting department of a large business is a great place to explore career opportunities. Marketing and Communications are two other fields that can be applied to a very large variety of companies. How did you hear about that new line of clothing that you must have? How do you think those ads on your sidebar line up with your interests? How did you land on that website that told you about the big concert happening this weekend? Marketing and communications. Print ads, social media, TV commercials, radio bits, street banners, handouts, you name it… all with well-written and attractive content. Marketing and communication majors are creative thinkers and producers. As a student exploring this field, you know that it evolves on a regular basis; sometimes so fast that it’s hard to keep up! The majority of companies out there have a marketing department, and if there isn’t a department then there is at least an individual responsible for getting the word out about their latest product or service. If there isn’t a particular type of company you’d like to work for (ie. a performing arts venue, an insurance company, a clothing company), start by looking into businesses with at least 50 staff members, as you’ll be more likely to find a department and learnership dedicated to this expertise. Or, apply to a marketing-specific agency. This area of study is a big one because it is meant for people who have a lot of ideas and are interested in a variety of career opportunities. Whether you want to manage a group of people, start your own business, or learn the ins and outs of how a company operates, this field covers a lot of ground. The business management major is likely to face a lot of competition when applying for learnerships for this very reason. A learnership at a company with many departments (accounting, training, marketing, development, HR, etc.) is a great place to start because it will give you an opportunity to dip your toes in everything. You may spend a few weeks in Human Resources and realize you’re simply not a people person. Or, you may work in the training department and find that you enjoy teaching new team members how to help the company operate. There is a wealth of knowledge to be had in business management, and even more opportunities for jobs.